With most people carrying smart phones and tablets with them at all times, many organizations incorporated these devices into their emergency communications efforts as a means to reach people in the event of a crisis. Alertus’ mobile phone apps offer any organization enhanced personal notification between authorized dispatchers and end users. Whether recipients are in hard-to-reach locations or dispatchers need to activate their emergency notification system remotely, the Alertus App Suite -- Alertus Recipient App and Alertus Activator App -- are loaded with features and allow for everyone to engage with the Alertus Emergency Notification System. Click here to watch a demo. Geo-tagged Incident Reporting: Users can report incidents with the user's current location, send a customized message in the message box, or select from multiple incident types with quick-action buttons via the panic button, in which users can select from multiple pre-set incident types with quick-action buttons to deliver to emergency management. Custom Branding: Organizations can custom brand the home screen and notification details so users easily identify notifications as an extension of the organization's safety resources. Public Safety Number: Organizations can list safety numbers so users can easily contact emergency personnel or services. Simple Interface: The Recipient App has a clean, intuitive interface that makes incident reporting easy and simple. Easy Setup: Users can easily download and install the Recipient App from the iOS App Store or Google Play store. Alertus Recipient App can send geo-tagged incident reports to emergency management. The Alertus Activator App is easy to install and configure for an organizations signup process. Integrated: Fully integrated with the Alertus suite of emergency mass notification products. Designed to work with third-party vendors, allowing authorized Alertus App users to quickly send emergency notification alerts to personnel. Customizable Preset Alerts: Alerts from the Activator App can be preset within the Alertus Server, and displayed text can be customized using the Alertus App interface. 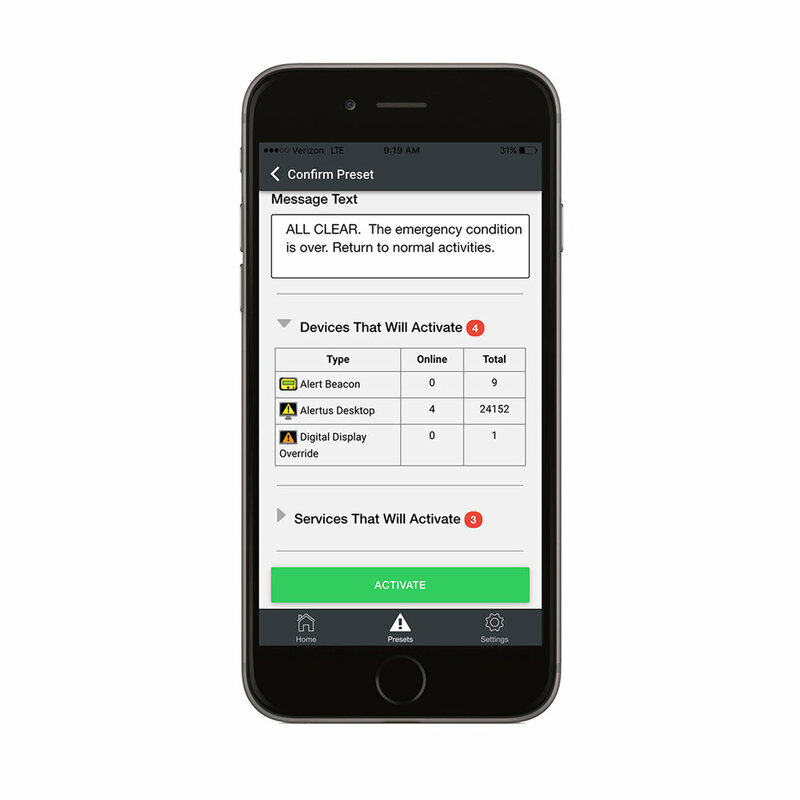 Simple Interface: Mobile phone app dashboard allows authorized dispatchers to easily customize and send preset alerts as well as view or cancel active alerts. Auditing/Reporting: Detailed, real-time reports track who receives/acknowledges each message and the current status of each client. Notification Coverage: Users who download the Alertus Recipient App to their mobile phones or tablets instantly receive emergency alerts when activated. Easy Setup: The Alertus Activator App is very easy to install. You can also configure the signup process according to your organization needs. All it requires is one or more of the following for mobile app signup and access—organization domain, email address, or pin code.